On Saturday, July 13 (the eve of Bastille Day, or as it’s known here, FÃªte National), there was a free concert of African music at the Place de la Bastille. Morgen had read about this, but it drew my attention a couple of days earlier when I saw the name Johnny Clegg (one of my all-time favorite musicians) flashed on one of the electronic public information boards scattered around town. The bad news—not that any of it was a surprise—was that there were something like 100,000 people crowding this huge plaza, which had been blocked off to traffic. (I have mentioned my feelings about crowds once or twice.) We had to stand around for hours while umpteen other bands played; naturally, there were no schedules to be found anywhere. 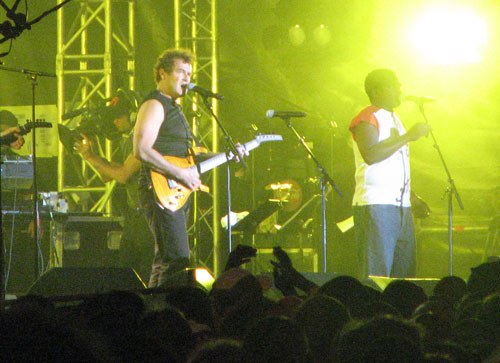 And when Johnny Clegg finally did come onstage, he played only four songs. But still: wonderful. I’d seen him in concert a couple of times before, but this was something special, like a big welcome party to our new home. Ohmygosh, i totally saw ads for this concert on the French radio website (R.F.I.) i sometimes listen to. I was drooling over the various bands listed in the ad, and would have loved to be there! Glad to hear that you were in attendance. Ann: When we were there, we said to ourselves that you would totally dig it! The other performers, by the way, were also excellent, it’s just that I didn’t know any of them. I suspect you would have!